We start by importing PyTorch. Then we print the torch version. 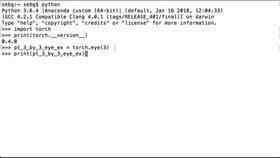 We see that we are using PyTorch 0.2.0_4. 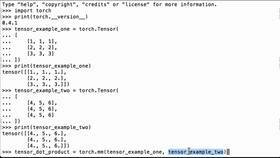 Then we import the variable functionality from the PyTorch autograd package. 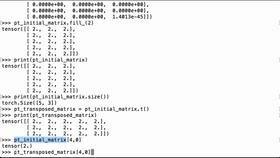 First, we’re going to create a random tensor example. So we'll use the PyTorch rand to create a 2x3x4 tensor. We're going to multiply it by 100 and then cast it to an int. That way, we can see that it is 2x3x4 and we made it an integer tensor. Here, we can see IntTensor so the numbers were easier to see. When we check the type, we see that it is class torch.IntTensor. Next, we’re going to define our random variable example. We use Variable with a capital V and we define the tensor inside of it the same way. We cast it to an int. We specify requires_grad=True to make sure that we are keeping track of all the operations. Then we can print our random variable example and we see that it looks exactly the same as the PyTorch IntTensors above. To make it more obvious, we can check the type of this variable and we see that it is the torch.autograd.variable.Variable with a capital V.